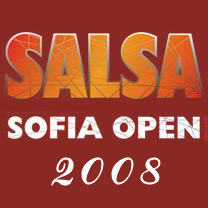 the Third isuue of Salsa Sofia Open. The competition will take place at April, 19th 2008. The categories will be as follows: Professionals(any style salsa on1 and on2), Amateurs(any style salsa on1 and on2), Teams(at least 3 couples), Solo Performers(1 person), Bachata and Merengue(couples). Salsa Sofia Open 2008 is a qualification for the WORLD CUP OPEN SALSA CHAMPIONSHIP 2008 which will take place in London in July 2008. The couple winner at the Professionals will be qualified directly for the semifinals and will earn airplane tickets and accommodation in UK.